by PaulEMoz in "2600", "Activision", "Atari", "Plaque Attack", "VCS", "shmup"
Anyone remember Silica Shop? It was awesome, especially when you were a kid. They were a mail order outlet based in the faraway town of Sidcup (I'm sure they had an actual, real shop there), and they sold Atari cartridges miles cheaper than you'd find them in the shops. I can't even remember where I got their catalogues from, but it was always with some excitement that I pored their pink pages. I know I bought a few games from there, for the princely sum of £5.95. That was an amazing price, given that I bought Activision's Grand Prix for £38 from a shop in town. StarMaster was one of my Silica purchases... I loved that game! I spent untold hours with that one. Another game that I played to death, again courtesy of Silica Shop, was Plaque Attack. If you asked what prompted me to buy Plaque Attack, I wouldn't be able to tell you. I honestly have no idea. I even remember that I hated its bright pink box. And yet, it found itself nestling in my box of cartridges. Maybe it was the weird premise that attracted me. You have to defend a mouthful of teeth from the scourge of dentistry... junk foods and sugary foods. You do this by blasting attackers with your tube of toothpaste. If it sounds a bit mental, you'd be right. But it's joyously so, as were so many games from the late Seventies and early Eighties. When it came to game concepts, it was pretty much anything goes. Plaque Attack is, I guess, the unofficial sequel to Megamania. Steve Cartwright was responsible for both games, but whereas the earlier Megamania was a straight forward shoot 'em up, Plaque Attack plays with the concept, refines it and adds extra elements to make it a much, much better game. 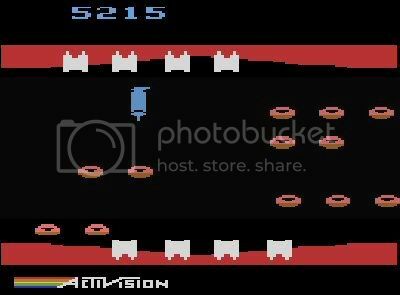 Mmmmmm, donuts! Lemme at 'em! Lovely pink icing.. yesssss. 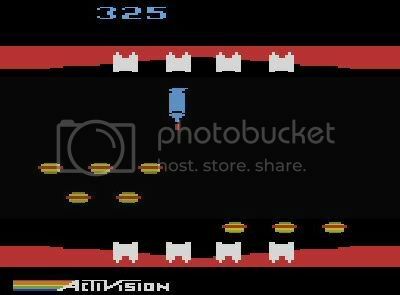 Imagine, if you will, the arcade classic Missile Command. Plaque Attack takes the city defending aspect of that game and applies it to the teeth. Of course, the average mouth has teeth at the top and bottom, so you've got to defend above and below. Although early enemies move slowly and don't present much of a problem, they soon speed up and start to move differently, making it much more difficult and meaning you've really got to be on your game. Those crazy "enemies" do raise a smile... you start off fighting burgers, hot dogs and chips, and move on to fruits, donuts, candy canes and ice creams. And this is where you discover the other game mechanic that makes this more interesting. If you've ever brushed your teeth (and I hope to hell you have! ), you'll know that a common problem with toothpaste is that it runs out. And that happens in this game. 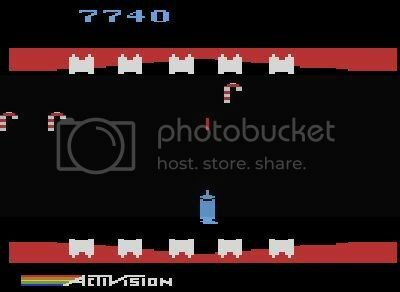 You have a limited supply of toothpaste for each level, so you have to pick your shots somewhat carefully... if you run out of toothpaste, any remaining teeth are completely at the mercy of those evil foodstuffs. Erm... I'm feeling a bit sick now, actually. The limited-shot aspect, combined with the tooth-defending, make for a surprisingly fraught and quite tense shooter. Luckily the game doesn't stay entirely true-to-life... every time you score a certain number of points, you'll earn an extra tooth. Early on this means you've got a huge gobful, but as you get into the game you'll be thankful to end a level with an extra tooth, just to top up your seriously decayed reserves. Plaque Attack actually holds up pretty well, even today. It can be a bit frustrating... those crazy attack patterns don't always lend themselves to a fun gaming experience. But you can't help but enjoy the concept and there's plenty of blasting action to be had. With Microsoft's Game Room still up and running and with Activision's Atari games having a strong presence there, Plaque Attack must be a prime candidate for release there soon. Keep your eyes peeled for it... mine will be.